Ornamental grasses are popular additions to the home garden. They are hardy and tolerate a range of conditions, generally do not need a lot of water, and their flowering habits creates a lively spectacle as they wave in the wind. There are a wide variety to chose from ranging from very low profile sedges, three foot tall Miscanthus, and the super sized Pampas or Toi Toi grasses. Both the latter grasses are Cortaderia and are among the largest grasses found in the ornamental family. Toi Toi is a native of New Zealand and is often called Toetoe. Is has five separate species that range in habit from coastal to very boggy terrain. Pampas grass is a native of Brazil but has adapted to many other areas where it is sometimes considered a pest due to its free seeding and wide seed dispersal. It can easily infest an area and crowd out native plants. Pampas is also called cortaderia Selloa or the purple Cortaderia Jubata. Both Toi Toi and Pampas are Poaceae or the grass family. Their classification is identical until classification of the variant types, which are different . Interestingly, the Toi Toi grass's genus is Cortaderia Stapf which is a pampas grass. The two are closely related and only differentiated in scientific classification at the late stage of species. The Toi Toi grass has a flower spire characterized by a drooping tip. It is a whitish or cream color and emerges in Spring or early Summer. The pampas grass produces a flower in late January to late May that is very sturdy and holds erect. The color of the flower can be pink, purple or white, and dries to a brownish hue. Both grasses share the characteristic of long, pointed flat leaves. Toi Toi grass has very prominent veins and a midrib that goes all the way to the leaves base. Pampas grasses have much finer veins in the leaves and the midrib does not go all the way to the base. 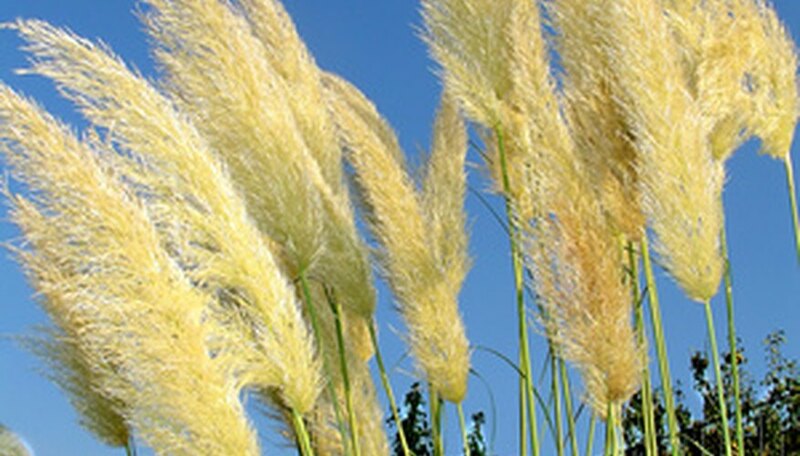 The Toi Toi has a leaf base that is white and waxy while the Pampas grass has a base that is not waxy. When leaves drop off the plant to make way for new, the Toi Toi leaves a clean break and does not spiral around the base. Pampas grasses lose leaves that fracture off and leave brown, dry curls of dead plant matter which looks like shaved wood. It forms around the base of the plant and exhibits a looped appearance at the base.